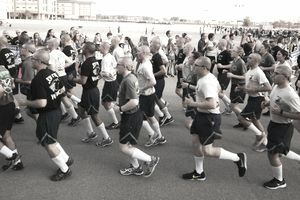 The final fitness test in Air Force Basic Military Training (AFBMT) is done during the end of the seventh week of training. That's not a lot of time to get into shape, even though you'll be working out six days per week during your time at basic. The following physical standards are required for enlistees upon arrival at basic training. Those who fail to meet any of these will be deemed medically unable to safely complete BMT. In this case, an enlistee may be processed for entry-level separation. Maximum abdominal circumference 39.0" 35.5"
After arriving at Air Force basic training, each enlistee will be measured for body mass index (BMI). Those who are at or below a BMI of 18.5 are required to undergo a medical evaluation before they take part in physical training (PT). Remember, the above standards are the minimum recommended before you arrive at basic training. These are not the graduation standards (which are much more restrictive). On the Saturday or Sunday after your arrival, you'll undergo an initial fitness evaluation. If you fail to meet the above standards, you can expect some additional attention from your training instructor (TI) and extra time dedicated to physical training each day. Push-ups and sit-ups must be performed with proper form. Those performed improperly will not count. Push-Ups: To complete a push-up, assume the front leaning rest position with your arms shoulder-width apart, feet together or up to 12 inches apart and body forming a generally straight line from your shoulders to your ankles. Keeping your head up, lower your body. Variation push-ups done on the knees are not permitted. Sit-Ups: When practicing sit-ups, lie on your back with your feet together or up to 12 inches apart, knees bent at 90-degree angle with a spotter holding your feet at the ankles. Place your arms crossed over the chest with your hands at the shoulders or resting at the upper chest. Bring your upper body forward until your elbows touch your knees or upper thigh. Lower your back until your shoulder blades touch the ground. Running: You can build up your running ability by starting out at a slow pace for 15 to 20 minutes. To ensure a smooth transition into the BMT fitness program, your goal should be a continuous 30 to 40 minute run 3-5 times a week. Consistency is the key. Make a schedule and stick to it. To help get into shape, you may want to try the recommended 14-week Basic Training Physical Preparation Program.